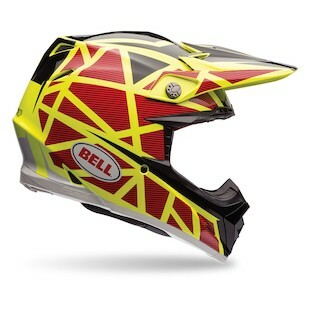 One of the most iconic names in the helmet game, Bell, is absolutely killing it in the Dirt riding market. Their latest rendition of a protective Dirt helmet, the Moto-9 Flex, combines the most rigid and light weight of shell constructions (Carbon Fiber composite) with the comfort of an X-Static interior liner that can be washed for those getting roosted with mud between braps. This helmet has taken the entire market for a great, lightweight, SNELL certified helmet by storm, with some new high-flying graphics to boot. The new Bell Moto-9 Flex Factory Helmet graphic is every Philadelphia Flyers, Baltimore Orioles, KTM, Cleveland Browns (are there any of you left? ), and San Francisco Giants fan's dream. As a die-hard fan of the Flyers, this is the graphic I would absolutely choose to ring out my throttle over hills and through the woods to glory. This is going to be the graphic that I can see every KTM rider choosing, to let everyone know from a distance that they are in fact, riding a two-wheeled Austrian beast. 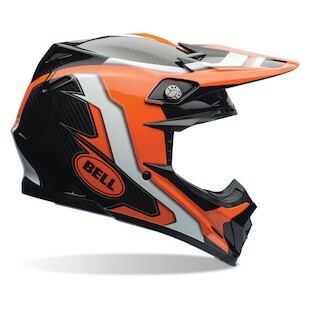 In my opinion, the Bell Moto-9 Flex Strapped Helmet graphic is going to be the choice of the rider who has to wake up early after a crazy techno/EDM/house light-show the night before, to hit the whoops for an early morning (likely near 1 pm) session. The almost Rockstar Energy-esc style and colors give the illusion of moving lightning fast even when you are taking that much need mid-session/race nap, to add a bit more flare to any rider’s repertoire. This would be my personal choice for anyone hitting the whips with a photographer in the stands, to add some flare to your next Social media main photo. One of the biggest names in sponsoring everything (regardless of relevancy) is Monster. In the two-wheel-engine world, Monster is one of the most iconic names and logos, letting everyone know that you are edgy and willing to start knuckle-chucking at a moment's notice. 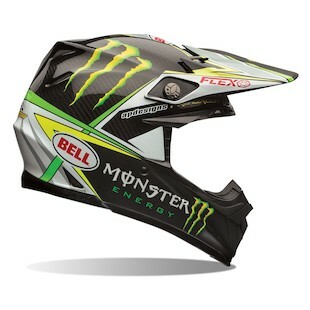 Bell has combined forces with Monster in order to create a sponsor style graphic for those looking to add a bit more flare to their lids. Incorporating the iconic Monster Green color and their logo to add a sponsored atmosphere for those trying to dress like their idols, the appropriately named Bell Moto-9 Flex Pro-Circuit Helmet is sure to be one the most popular from Bell. Bell is capping off their already popular Moto-9 Flex Helmet with graphics that are sure to turn heads and get even the most average of riders noticed. Bell is dropping these graphics this coming year, and are sure to be some of the most popular graphics in the Dirt market.